sweet pup Portraits - capture the love! The 2019 Eleven Sweet Pups and One Special Cat CALENDARs are here! See the bottom of this page or order on - other art offerings. Welcome! My vision is to create portraits that honor man and woman’s best friend: those amazing, loving, wonderful Dogs. I love all animals but dogs have a special place in my heart. They give so much to us in a true, pure way. I know that all of my dogs, in all of my years, have enriched my life immensely. With dogs being so connected to us humans, I believe they were sent here to help us in many ways. They love us unconditionally, provide us with sweet companionship, they make us laugh and smile, they teach us things and comfort us, and that’s just for starters. They remind us of being present and in the moment, and the joy in that. I see them as angels here on earth. So the way I choose to honor them and to celebrate their beautiful existence is to paint them. I think dogs have a Spiritual Essence just like we do. 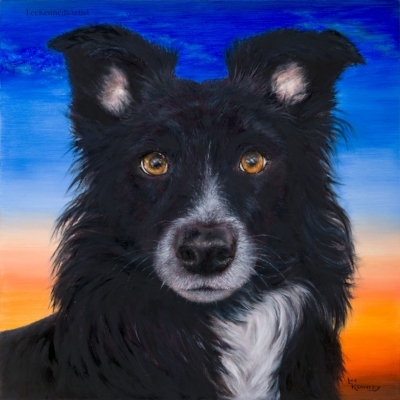 I capture the essence of your Sweet Pup in the painting so you can always connect to that unconditional love in their remarkable faces. This portrait service is dedicated to the memory of a dog that brought so much joy into my life: my dearest Winston. He was my all-time favorite dog. He seemed almost human at times. He was sensitive, loved to talk, would sing with me, and he was an all-around character. He made me laugh every day. I do wish that dogs lived longer.. To me it is like losing a family member when they pass. Why can’t they live as long as a turtle? They put up with so much of our “stuff” and never judge us. Bless their souls. I am glad that I have a portrait of Winston. It makes me smile to see his big ole’ brown eyes looking at me every day. I will need at least one clear photo of your dog. My normal process is to create a realistic painting from the photo(s), but I can add unique artistic touches. If you are local to me (in the greater Seattle/Eastside area), I would love to meet your dog to really get to know your Pup's 'pup'sonality and essence! Upon receipt of your order and deposit, I will send a confirmation email and a contract for you to sign. Then, after drawing your dog and doing some initial painting, I will do a midway check with you. 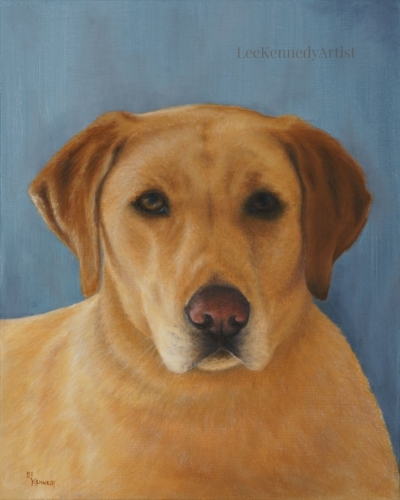 Please call me at 425.478.0363 or email me at leekennedyartist@gmail.com to discuss having a portrait created for your precious pup! Portraits are available in Gallery Wrap Canvas (1.5" painted sides). The Gallery wrapped paintings don't need to be framed. Tax will be added to the price. The prices above are for a basic head and bust or simple head shot with a basic background. Other background options are available by special order. Note: the 12x12 size is good for showing a face shot only. Here is sweet Levi donning the month of March. These Calendars are featuring oil paintings I created of Eleven Sweet Adorable Pups and One Special Cat. They are showing on a variety of beautiful and different splashes of color and the calendar pages are on premium glossy card stock.